Last November, I wrote about how my Magic Mouse would repeatedly lose its connection to my Mac Pro. After some effort, I gave up trying to resolve it—and went back to using my reliable Bluetooth Mighty Mouse instead. 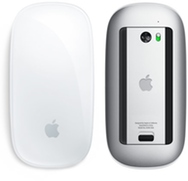 Over the next few months, a consensus emerged that the disconnect symptom was the result of some unhappy interaction between the Magic Mouse and the Mac Pro (especially the 2009 model). The Mac Pro did not have a problem connecting to other Bluetooth devices—and the Magic Mouse did not have a problem connecting to other Macs. In the last week, I had reason to revisit this matter. I was considering buying a Magic Trackpad. However, I didn’t want to get one and discover that it had the same problem as my Magic Mouse (now grumpily sitting in my drawer). This led me to check out the current status of this symptom. At first, it seemed there was still no quick and easy fix. Several theories focused on the Bluetooth antenna in the Mac Pro as the culprit. A Cult of Mac article stated that the location of the antenna “causes the Mac Pro to have much spottier Bluetooth reception than other computers with better placed Bluetooth antennas, and the Magic Mouse is particularly fussy about it.” One theory went further, claiming that the cables connecting the Bluetooth antenna to the Mac Pro’s logic board were incorrectly installed in the reverse position. Potential solutions? Open up the Mac Pro and reverse the relevant Bluetooth cable connections. Or install a new Bluetooth antenna. Or go with a separate USB Bluetooth dongle. Or, as the most extreme action, have Apple replace the entire outside case of the Mac Pro (as a few users reportedly had done). None of these fixes are guaranteed to work. As such, I had no intention of risking new problems by fiddling with my Mac Pro’s hardware—not when I could more easily avoid the problem altogether simply by not using a Magic Mouse. I was about ready to give up when I happened upon one final suggestion: Remove the battery cover of the Magic Mouse. I tried it. Amazingly, this quick and easy fix entirely eliminated the connection problem. My Magic Mouse is now performing quite well. Actually, there was one morning in the past week when the symptom mysteriously returned for a brief visit; but it then vanished again. In case you’re wondering, the batteries won’t fall out with the cover off. There’s also no aesthetic downside; you can’t see that the cover is absent once the mouse is in working position. Apple is aware of the symptom and believes the ultimate cause is the Magic Mouse itself (given the battery cover fix, I would have to agree). Apple plans to release a Magic Mouse firmware update to remedy the problem. However (no surprise here), the Genius could offer no clue as to when this update might be available. Apple is unaware of any similar problems with the Magic Trackpad. The Genius was confident that, if I tried a Trackpad, it would work just fine. In fact, the Genius was willing to do a free exchange of my Magic Mouse for a Magic Trackpad (despite the fact that my Mouse was long past its return period). I would have agreed to this swap except for one catch: The Apple Store currently had no Trackpads in stock. Instead, I got a raincheck. No consensus emerged among the replies. The Trackpad wound up with a slight edge, but not by much. A bit surprising (at least to me): several people said they would reject both devices, preferring a third-party alternative instead. A couple of people were especially negative regarding the Trackpad, claiming that it hurt their wrist to use it. This wasn’t helping me at all. I still haven’t decided what to do. But I will… eventually.